Desi Smith/Gloucester Daily Times. 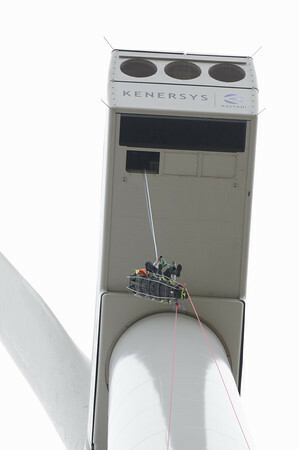 Ipswich Fire Lt. Andy Theriault (top) starts lowing North Andover firefghter John Weir (in basket) some 400 feet to the ground in a rescue training exercise with the Essex County Technical Rescue Team at the Varian Semiconductor's wind turbine on Dory Road, Gloucester. October 18, 2013.